In addition, the two leaders welcomed the State of Virginia to the Under2 Coalition — a group of governments from around the world committed to tackling climate change. In late October, the ‘We Are Still In’ coalition revealed its plans for the upcoming 23rd Conference of the Parties to the UN Framework Convention on Climate Change (COP23), including its intention to send a US Delegation of Climate Leaders and erect a US Climate Action Center pavilion. Saturday, Governor Jerry Brown and Michael Bloomberg launched “America’s Pledge on climate change” — a new initiative intended to identify and quantify the actions of states, cities, and business throughout the United States aimed at driving down their respective greenhouse gas emissions in line with the goals of the Paris Agreement. Governor Brown delivers remarks at the US Climate Action Pavilion. “Today we’re sending a clear message to the world that America’s states, cities and businesses are moving forward with our country’s commitments under the Paris Agreement — with or without Washington,” added Governor Brown, who was recently named Special Advisor for States and Regions ahead of the United Nations’ 23rd Conference of the Parties to the Framework Convention on Climate Change (COP23). 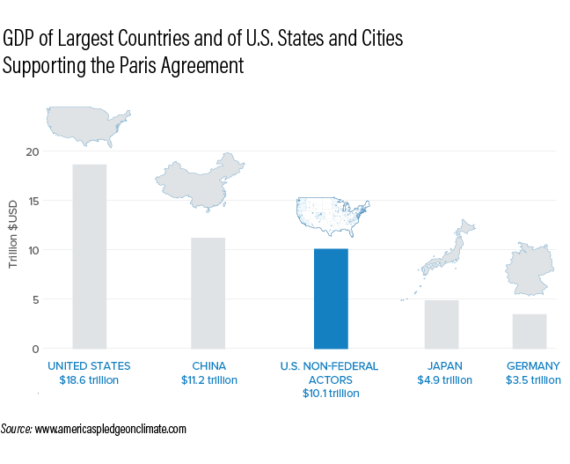 The America’s Pledge initiative will for the first time aggregate the commitments of states, cities, businesses, colleges and universities, and other non-Party actors in a report detailing the full extent of climate-related activities across American society and business. Governor Brown and Bloomberg will work to demonstrate and enact climate leadership across America regardless of the top-down apathy of Donald Trump and Co., while simultaneously proving that sub-national efforts can significantly reduce the country’s greenhouse gas emissions. Further, and commissioned by Brown and Bloomberg, the Rocky Mountain Institute and the World Resources Institute will work together to lead an analytical effort to support America’s Pledge. America’s Pledge also launched a new report, which highlighted the fact that the total number of non-federal actors, which numbers more than 2,500, represent more than half of the United States’ economy, and if they were their own country they would be the world’s third-largest economy. The announcement and launch of America’s Pledge was not an insider affair, and the event at the US Climate Action Pavilion was attended by United Nations Framework Convention on Climate Change (UNFCCC) Executive Secretary Patricia Espinosa, COP23 President Prime Minister of Fiji Frank Bainimarama, as well as Senators Ben Cardin of Maryland, Ed Markey of Massachusetts, as well as Pittsburgh Mayor Bill Peduto, Walmart Senior Vice President of Sustainability Laura Phillips and California’s Secretary for Environmental Protection Matt Rodriquez.